The more she told me about it the more I realized I was wrong. Content calendars are exactly what small organizations with little resources like centers for child care need to be doing. So let’s start making a content calendar for your child care center! Step 1 – What’s a Content Calendar? It’s exactly what it sounds like. A plan to produce marketing material around a calendar. You might also have heard of an editorial calendar. The benefit of this to your child care center is your probably send out newsletters, you might tweet, you might put things on your blog, or newsletter. 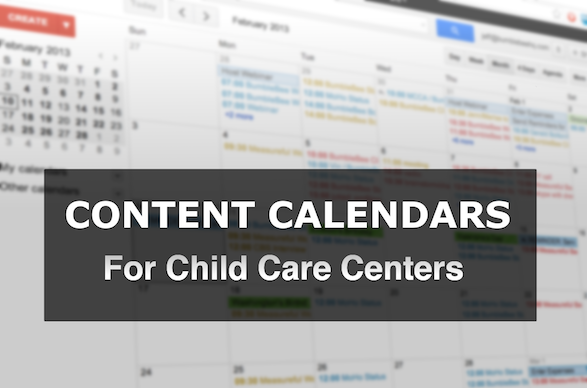 The content calendar just sets a framework for you to fit your childcare center’s content into. It’s really just a great tool to keep you from procrastinating on marketing activities. Start your clocks because this will take no more than 2 minutes and don’t worry we’ll work through it together. Of course, I am assuming here you already know who your audience is: new families, prospective families, staff, alumni, etc. For this exercise, let’s say you are sending a newsletter to your childcare center’s current families. March: Spring is Here! Earth Day, Planning for Summer Camps and Family Vacations. Congratulations! You just created a content calendar! Now that we have taken a first pass, you may want to go back and think about your child care center’s schedules. How does the content calendar square with your program year, open-houses, etc. The best tool is probably going to be your Google Calendar, Outlook calendar, or just a plain, old boring spreadsheet. Take the list we created above, copy it into your spreadsheet or add it to you calendar month by month. A spreadsheet is probably going to work best. Add a couple columns for placeholders. In my content calendar I added a column for the person responsible at the child care center, the format (e.g., child care newsletter) and a notes column (Free content calendar template). If you need to get more frequent communications with your audiences, you can. Break each on of the months into weeks and put more details into each on of those. Content calendars need not be restrictive. If something timely comes up like flu vaccinations and young children, feel free to override your calendars plan. Try it out and let me know how it works. Please comment on whether you would or if you already use a content calendar. Jeff is the Director of Marketing and Co-founder of BumbleBee Childcare Software. He lives in Cambridge, MA, in the United States. You can hear more from Jeff on Twitter and Google +.